Back To You » Don't miss the premiere of Back to You, the new sitcom starring Patricia Heaton and Kelsey Grammer tonight on FOX, 8/7c! TV Alert » Be sure to tune into The Rachael Ray Show tomorrow to catch Patricia when she stops by to promote the premiere of Back To You. Head on over to RachaelRayShow.com for your local listings. In the meantime, here's two sneak peak photos from her upcoming appearance on Rachael Ray. Emmys » Patricia Heaton and Kelsey Grammer presented at the Primetime Emmy Awards last night, check out some photos of Patricia on the red carpet and on stage. Emmys » Don't forget to tune into the 59th Primetime Emmy Awards tonight on FOX! Patricia Heaton will be presenting alongside her Back To You co-star, Kelsey Grammer. Keep an eye out for Ray Romano and Brad Garrett who also have been confirmed as presenters tonight. The ceremony will broadcast live from the Shine Auditorium, 8pm ET onwards. Back To You » Not long to go! Back To You premieres this week on FOX. The critics over at Entertainment Weekly and Hollywood Reporter give the pilot episode a thumbs up, Variety's not so convinced. Catch the premiere this Wednesday 8pm/ET on FOX. TV Alert » Patricia appeared on The Morning Show With Mike and Juliet last Friday, head over to their site to watch the clip of her appearance. Patricia will be a guest on The Rachael Ray Show this Wednesday to talk about her new show, so don't miss it! Back To You » Patricia Heaton returns to television this fall season with the debut of Back To You later this month on the FOX network. This new sitcom which she stars alongside Kelsey Grammer, premieres Wednesday, September 19, 8pm ET. Tapings » Be a part of the studio audience at a taping of Patricia's new show! Audiences Unlimited has taping tickets available over at Tvtickets.com, so head on over if you're keen to see an episode filmed. If you can't make it to a taping, you can still picture yourself on the set by visiting Backtoyouanchorizer.com. TV Alerts » Be sure to watch Live with Regis and Kelly this Thursday, Sept 13 when Patricia Heaton stops by for a chat. She'll also be appearing as a guest on Conan O'Brien late Friday night (airs NBC, 12:35am ET). Emmys » Tune into the 59th Primetime Emmy Awards next Sunday on FOX to catch Patricia and Kelsey Grammer presenting together during the awards ceremony. The show will broadcast live from the Shine Auditorium, 8pm ET onwards. DVD » Later this month, fans will be able to complete their Everybody Loves Raymond DVD collection when the final box set is released in stores Sept 18. The 9th season set includes the Emmy nominated Last Laugh retrospective, so be sure to pick up a copy! DVD » On October 30, HBO Home Video will release the entire nine seasons of Everybody Loves Raymond as a specially-packaged DVD collectable set. It comes with a slew of bonus features including a copy of the series finale script autographed by the show's writers. Event » Speaking of the Raymond writers, catch them together at their next Inside the Writers' Room Event. They'll be appearing at the Raymond F. Kravis Center, West Palm Beach, Florida this November 10 and 11. Tickets go on sale this Saturday, Sept 15. Amazing Grace » Available to pre-order now over at Amazon and Barnes and Noble is Amazing Grace, which will be released onto DVD November 13. If you can't wait til then for your copy, purchase a Region 2 version of Amazing Grace, available now in the UK. Gallery » Patricia Heaton attended the FOX Television Critics Association Party held at Pacific Park, Santa Monica Pier yesterday. Click here to view photos from the event. Back To You » Other cast members from Back To You were also snapped on the red carpet at the FOX TCA Party, see photos of Fred Willard, Ty Burrell, Laura Marano and Ayda Field here. 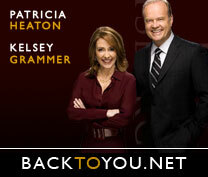 Back To You, the new comedy to star Patricia Heaton and Kelsey Grammer, will air on Wednesday September 19 at 8pm ET. DVD » The Everybody Loves Raymond Season Nine DVD set is available to preorder at Amazon and Barnes and Noble. It will be released in stores on September 18 complete with interviews, audio commentaries, the Laugh Laugh special and more. DVD Region 4 » Australian fans: remember to drop by your local video store to pick up a copy of	The Engagement Ring which was released for rental last week. As for when you'll be able to complete your Everybody Loves Raymond DVD collection - mark September 5 into the calendar, that's when both the Season 8 and Season 9 box sets will be released in Australia. Til Death, which will be available in stores from August 21. The 3-disc set includes all episodes from the first season, along with bonus behind-the-scene featurettes, bloopers and bonus previews. Engagement Ring DVD » Just a heads up for Australians who haven't yet seen The Engagement Ring - from July 11 onwards, this Patricia Heaton telemovie will be available to rent on DVD from your local video store. Click here for DVD cover art. Back To You » Continuing on with news abroad, Channel 4 in the UK has just picked up the exclusive rights to air Back To You. For other Back To You updates, head over the the news desk at BackToYou.Net. in the 8pm timeslot this fall. Check out BackToYou.net in the meantime to get the scoop on this new show. Season 9 » A DVD release date for the last season of Everybody Loves Raymond has been announced - Season 9 will be available Sept 18 complete with the Last Laugh special, behind-the-scenes interviews, audio commentaries, bloopers and deleted scenes. Amazing Grace » For those in the UK, Amazing Grace will be available to rent from July 23 and to buy from August 6. The DVD is being released by Momentum Pictures. Elsewhere, Amazing Grace will open in cinemas in New Zealand July 19, and in Australia July 26. 95 Miles to Go » 95 Miles to Go will be premiering on HBO next month, beginning July 3. For listings, visit the HBO.com. Directed by Tom Caltabiano, the documentary captures Ray's eight-day drive through the south during a stand-up comedy tour. Stand up » Speaking of standup, you can catch Brad Garrett at The MontBleu Theatre, Lake Tahoe next month July 21. Brad also has appearances lined up at the Tropicana Casino, Atlantic City (Sept 1-2), and Paramount Theatre Aurora, IL (Dec 28). Back To You » Head on over to FOX.com to watch three video clips from the pilot episode of Back To You, the upcoming comedy that stars Patricia Heaton and Kelsey Grammer as co-anchors of a Pittsburgh news station. FOX Upfronts » Patricia Heaton and Kelsey Grammer were in New York City yesterday to attend the Fox Network Upfronts to promote their new series, Back To You. Click here to see photos of their arrival at the event. Back To You » FOX officially unveiled its upcoming fall schedule today. Click here, here, and here to view promo photos of Patricia Heaton and Kelsey Grammer from their comedy, Back to You, which will premiere this fall in the Wednesday night 8pm timeslot. Gallery » Earlier this week, Patricia Heaton attended the 22nd Lucille Lortel Awards, having been nominated in the Outstanding Lead Actress category for her Off-Broadway role as Stella in The Scene. Here are a few photos from the event. Gallery » Yesterday, Ray Romano, Brad Garrett and Doris Roberts attended Stars Over Viewpoint, a benefit for Viewpoint School which took place at the Beverly Hilton. View some snaps from last night's event here. DVD » Be sure you pick up the latest Everybody Loves Raymond DVD set to be released - the 8th season is now available in stores complete with commentaries, deleted scenes and bloopers. Check out DVD Talk and Sitcoms Online for their detailed reviews of the box set for more info. FOX » FOX has announced a renewal of Brad Garrett's comedy Til Death for a second season. The comedy is rumored to be a possible pairing with Back to You, the Patricia Heaton and Kelsey Grammer sitcom that has also been officially confirmed as part of FOX's upcoming lineup. The full fall schedule for FOX will be revealed next Thursday during the annual Upfronts week for the networks. Pilot » The pilot of the new sitcom starring Patricia Heaton and Kelsey Grammer is being taped tonight at FOX Studios in LA. The comedy series, Back to You, (previously titled Action News) stars Patricia and Kelsey as news anchors and former colleagues who reunite at a Pittsburgh TV station. Back To You » Televisionary was among the audience members who attended Tuesday's run-thru of Back To You - visit his blog for a recap. Following the run-thru, casting changes have been made; Josh Gad and Ayda Field replace actors Paul Campbell and Aimee Garcia who were originally cast in the series. Details here. The Scene » Patricia was recently announced as a nominee in the Outstanding Lead Actress category for the 22nd Lucille Lortel Awards. She has been nominated for her Off-Broadway performance as Stella in Second Stage Theatre's The Scene. The awards ceremony will be held May 7 at New World Stages. Auction » Earlier this month Patricia and David Hunt were honored at the Comedy for a Cure benefit for the Tuberous Sclerosis Alliance. Access Hollywood covered the event (watch clip), as did LA Daily News (read article here). Clothes Off Our Back is hosting a celebrity auction now with proceeds benefiting the TS Alliance. A Night of Comedy » Speaking of benefits, this Saturday April 14, The Children Affected by AIDS Foundation will hold its annual fundraiser, Night of Comedy V, at the Wilshire Theatre Beverly Hills. Ray Romano is one of the comedians to headline the event, to be hosted by Doris Roberts. Stand up » The following day, Sunday April 15, Ray Romano and Brad Garrett kick off their joint comedy stand up tour in Atlanta. They will then make stops throughout next week in South Carolina, Florida and Mississippi before wrapping up in Las Vegas. Click here for tour dates and details. Comedy for a Cure » Patricia Heaton and David Hunt were among the honorees at the 6th Annual Comedy for a Cure event held yesterday. The event, benefiting the Tuberous Sclerosis Alliance, took place at the Music Box@Fonda, Hollywood. Here's some photos from the event. Action News » The pilot episode of Action News will be shot next month at Fox Studios in LA. Tickets to the pilot taping (scheduled to take place April 13th) are available over at Audiences Unlimited, click here to apply for tickets. Action News » FOX has released details about their primetime development projects for 2007-2008. Here's the series description for Action News, the comedy that will star Patricia Heaton and Kelsey Grammer with 13 episodes ordered so far. Radio » Last month, Stan and Terry of Chicago's 105.9 WCKG FM interviewed Patricia Heaton about Amazing Grace and Action News. Listen to a stream of their chat with Patricia here, or download the podcast here. TV Land » Ray Romano's appearance on Sit Down Comedy with David Steinberg premieres online next Monday, followed by the TV Land broadcast on Wednesday March 28. A sneak peak of his segment can be downloaded here: audio, video. TV Alert » Tune into Entertainment Tonight today to see ET's Kevin Frazier sit down with Patricia Heaton to talk about her upcoming FOX show co-starring Kelsey Grammer, Action News. ETOnline has a video clip and a recap of the segment here. Comedy for a Cure » Patricia Heaton and David Hunt are among the honorees of this year's Comedy for a Cure event, benefiting the Tuberous Sclerosis Alliance. The event will take place at the Music Box@Fonda, Hollywood on April 1. The evening will include special performances by Ray Romano and Sherri Shepherd. Amazing Grace » Patricia Heaton recently sat down with IESB to chat about Amazing Grace - click here to watch her interview. Head over to AmazingGraceMovie.com for more information on the movie and to view listings of where the film is currently playing. Action News » In casting news, Fred Willard, Paul Campbell and Aimee Garcia will join Patricia and Kelsey Grammer on the set of Action News. This new sitcom will star Patricia and Kelsey as two co-anchors (Kelly Carr and Chuck Tatham) who work at a Buffalo news station. The FOX network has already greenlit 13 episodes that will air during the 2007-2008 TV season. Action News » Read Patricia Heaton's and Kelsey Grammer's take on Action News in the LA Daily News, NY Daily News, and The Chicago Tribune. Action News was also the topic of Monday's TV Guide Ask Matt column. TV Alerts » Next week Brad Garrett is making the rounds on the talk show circuit, stopping by ABC's The Tonight Show with Jay Leno (Mon 12th), The Ellen DeGeneres Show (Tues 13th) and ABC's Jimmy Kimmel Live (Tues 13th). TV Land » Ray Romano's appearance on Sit Down Comedy with David Steinberg premieres later this month. It will be released online March 26, followed by the TV Land broadcast on March 28. Download a sneak peak of his segment here: audio, video. Stand up » Tickets go on sale today for Brad Garrett's April 22nd stand up gig at the Grand Casino Hinckley Event Center, Minnesota. During mid April, Ray and Brad will be making a number of stand up appearances together, click here for details. Last Word » Filming starts this month on The Last Word, a Geoffrey Haley romantic dramedy that will star Ray Romano, Winona Ryder and Wes Bentley. The movie's plot centers on a writer (Bentley) who makes his living composing other people's suicide notes. His life gets turned upside down when he enters into a romance with the sister (Ryder) of a recent client. Birthday greetings go out to Patricia today, happy 49th birthday! TV Alert » Tune into CBS tonight when Patricia Heaton stops by to chat with Craig Ferguson on The Late Late Show. She'll be on to talk about Amazing Grace, which is due out in cinemas this Friday. The Late Late Show airs at 12:35am. Magazine » Pick up a copy of the bimonthly Christian lifestyle publication, Homecoming Magazine, to read an exclusive interview inside with Patricia Heaton. She appears on the Jan/Feb 2007 cover of the magazine.